The plain, white box has been sitting on my kitchen shelf for 4 years and 8 months. It contains the ashes of my dog, Jake, who left my life in June of 2006. I spread some of those ashes in many of the places we had gone to throughout our years together. 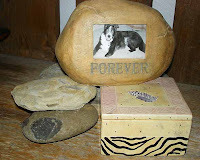 On the first anniversary of Jake’s passing I put most of his remaining ashes in a beautiful stone box which sits on the mantel. The box cover has a black and white feather – just like the ones in Jake’s heavenly angel wings. 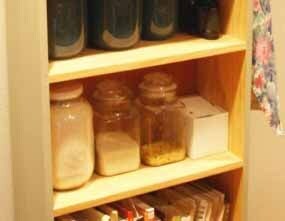 My intention was to spread the rest of the ashes and let the white box on the kitchen shelf go away. But I just couldn’t bring myself to do it. For some reason, I take great comfort knowing that box is there. So the white box sits on the shelf, next to the macaroni. I suspect it’s going to be there for a very long time. I have never chosen to receive ashes back of any of my pets. I don’t know that I would be able to do anything with them either. When I got my first ClayPaws print from my Lissy cat, I let it sit, unbaked, for about a year. I couldn’t even face baking it – it seemed so final. I did, finally, get it baked, so it was a permanent memory, but wow… that small act was more than I could handle for a long time. So, all that to say – I think I understand why your white box is still on your shelf, and will likely stay there!